The pressure of living up to the hype of being the fourth pick in the 2017 draft. The roller-coaster ride of being young in the NBA. The challenge of already having three head coaches. Phoenix Suns forward Josh Jackson is hopeful he can help the Suns emerge from the dark clouds alongside budding star Devin Booker, 2018 No. 1 pick Deandre Ayton and new coach Igor Kokoskov. In collaboration with The Undefeated’s Marc J. Spears, Jackson is giving readers an exclusive look into his sophomore season in his own words. The 22-year-old from Detroit isn’t afraid to say what’s on his mind. He once trash-talked with Hall of Famer Gary Payton while playing for a prep school in Napa, California, of all places. The key for us since the All-Star break: One, communication. Two, playing a full 48 minutes. The communication part, I feel like it’s something we’re still getting better at. I see times where we have stretches and we don’t talk on defense and offense, and it can kind of show that we’re not communicating because you can see that we’re not on the same page. There’s been plenty of times this season and last season where we’ve played good in the beginning of the games, or stretches, but never throughout the whole game. … We took a punch [during our Golden State Warriors win] and then we responded, we came back and we continued to fight. I think we got down like, 16, and still came back and won the game. I feel like we’re now having a lot of fun out there in our games. Our communication’s better and we’re playing the right way. The key for me since January 1st is just getting to pick and choose my shots and just to continue to play hard. I feel like there are times where I’m playing a little bit too hard and I get a little bit out of control, when I’m just trying to recognize those moments and pull myself back from it and slow down a little bit. That’s also a skill I’m working on. I just had a family matter that I had to attend to, and that was pretty much why I couldn’t make it. If I say that I was going to be at something and I agree to do something, I’m the type of guy that I’m gonna do that. And if I don’t, if I’m not there or if I’m not doing something that I tell you that I’m gonna specifically do, then something is actually wrong, everything is not OK. So, it is what it is. I took the fine. I took a little bit of backlash from the fans. But I feel like things will be fine. People who know me, they understand. I don’t think it’s anybody’s business, to be honest. I heard about what happened to Russell Westbrook in Utah. I think it’s something that happens a little bit too much. There is some way we should try to control it and get a handle on it. Players are getting fined. Fans are still allowed to say whatever they want to say. They’re close to the court and able to say all these things. That shouldn’t happen. That shouldn’t be allowed. Anything that someone says of that nature is all bad and on the same level. Nothing is worse than the other. Of course, I’ve heard something racist on the college level and high school. Nothing I would want to share. I haven’t heard it in the NBA. 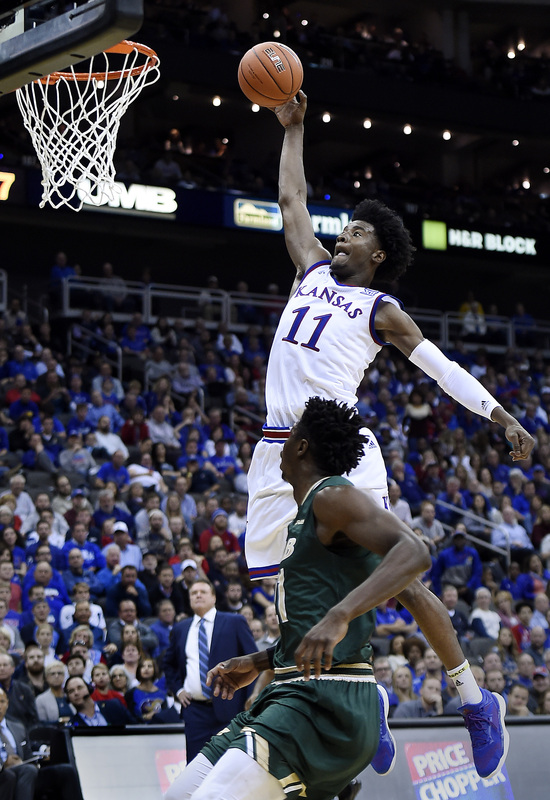 Kansas coach Bill Self (rear) watches Jayhawks forward Josh Jackson sail toward the rim for a dunk attempt in the second half against UAB on Nov. 21, 2016, during the CBE Classic semifinal game at the Sprint Center in Kansas City, Missouri. My fondest memories of the NCAA tournament was just the atmosphere around all the games. Being at a venue where all these teams are going to play and somebody has to go home, the competitive spirit and the atmosphere with the crowd, the fans and the students. The mixture of it all is real special. (Jackson’s Kansas team was eliminated in the Elite 8 of the 2017 NCAA tournament after a 74-60 loss to Oregon). The advice I would give to someone leaving college to go to the NBA is to keep a small circle and keep people around you that you trust. Those are the two most important things. You got to have people that are going to be honest with you and real with you. Throughout this process you meet a lot of people who act like they can help you, but they’re really trying to help themselves. Always remain confident in yourself. If you have the opportunity to get picked in the draft, it’s an honor no matter where you go, where you play, what pick you get picked up. It’s an honor to play in this league, so continue to be yourself, work hard and make the best of any situation you are given. After I got drafted in New York, after the draft pretty much was over, I really had the feeling like, ‘Wow, I’m not an amateur no more. This is really happening.’ All the energy around the draft with my family, other guys that I knew that were also being drafted, seeing them, being there, it became real at that point. Zion Williamson is amazing, a really good player. He has to keep working on his game and keep building. He’s special with his potential and with everything he can do. He’s superathletic. When I look at him, I see so many things he can add to his game. Adding a few fundamentals will take him over the top. We haven’t talked about him being with the Suns next season. But if it happens, we would welcome him with open arms. He’d fit right in.